When you’re mixing height, weight and potentially dangerous equipment, we believe there’s no such thing as an acceptable level of risk. Trees are heavy things, and even a small branch can do considerable damage if dropped from a height. Safety is paramount – yours, ours, the public’s, your property and your belongings. We go to great lengths to keep everyone and everything safe. But because things can sometimes be beyond our control, we also have extensive insurance cover. We carry £10,000,000 public liability insurance. When it comes to working with trees, prevention is always better than cure. Over the years, we’ve developed policies that help us to define our service. We currently hold policies for Protection of Wildlife, Environmental, Sustainable Development, Health & Safety, and Equal Opportunities. We adhere to all good codes of practice within our industry, including BS 3998 – Recommendations for Tree Work (2010) and BS 5837 (2012). In 2013 we achieved ISO9001, ISO14001 and OHSAS18001 status. At Ringrose Tree Services we believe passionately in the importance of ecology. We’ve a number of well-researched and effective procedures in place to protect and preserve the environment, and as a result, we’re proud to have an impeccable environmental record. The Conservation (Natural Habitats, &c.) Regulations 1994. Pollution Prevention & Control Act 1999. The Countryside & Rights of Way Act 2000. Follow a rigorous Sustainable Development Policy at all times. Recycle waste to improve waste management practices. We supply our woodchips to large power companies to create carbon neutral electricity. Strive to reduce emissions and pollution. Reduce consumption of natural resources wherever possible. Make every effort to minimise noise and other nuisances while carrying out our operations. Ensure that our working culture encourages constructive conservation. Offer Terravention Services, which uses pneumatic injection to decompact and feed the soil, which in turn improves the ecology and resources in the rhizosphere (the zone that surrounds the roots of plants). 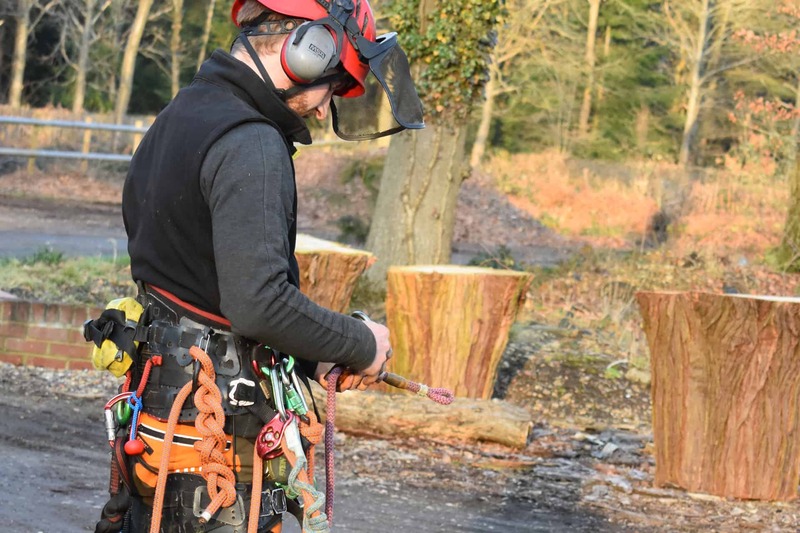 Ringrose Tree Services offers a fully integrated service that comprises every aspect of the tree care service, in a responsible, ethical and highly effective manner. As tree care professionals, the environment is our business and our passion, and we do everything we can to preserve the delicate natural balance. At Ringrose Tree Services we aim to ensure that the business meets best practice standards wherever possible, and minimum requirements in all other aspects, set by the environmental law in this country. We also endeavour to be prepared to deal with the demands of future legislative developments. Working on trees and hedges can be a messy business. But you don’t need to worry about that. We take care of the waste as part of every project – unless you don’t want us to of course. Our team all take a pride in their work, and endeavour to leave every garden or grounds better than they found it. We’re registered by the Environment Agency to carry waste, so we operate within government guidelines and take our responsibility to you and the environment very seriously. We believe our work should be sustainable and enriching to our environment, and endeavour to recycle as much as possible. Here are a few of the ways we resolve the waste issue. Woodchips can make useful garden mulch, helping to suppress weeds. Please just let us know if you’d like us to leave the woodchips for you to use. At Ringrose Tree Services, we’re proud to support biomass fuel projects, using by-products such as woodchips to heat homes across the UK. One of the key benefits of biomass fuels is that they don’t contribute to global warming, and are considered clean and renewable. This is because, while a plant is alive and growing, it absorbs carbon from the atmosphere during photosynthesis. The same amount of carbon is released when the plant decays or is burnt. Using wood by-products as a fuel creates a balance between the amount of carbon the biomass fuel releases into the atmosphere, and the amount extracted from it, known as a carbon cycle. We’re always happy to leave timber for firewood. It’s not normally left in ready-to-use sizes, unless specified in the quotation, but we do offer log splitting as an extra service. We’re happy to quote for this separately.